After 1814, the Nidaros Cathedral were seen as a national icon and its position was strengthened by the fact that the Constitution of 1814 also designated Nidaros Cathedral as a coronation church. The Nidaros Cathedral has been subject to continuous restoration projects since the restoration of the first phase began in 1869-1877. 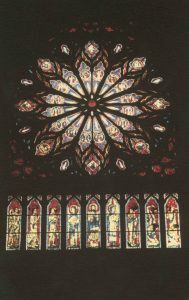 An interior committee for a plan of renewal for the cathedral towards the St. Olav’s anniversary in 1930 was formed, but did not include the construction of the rose window for economic reasons. Marie Ihlen Gleditsch engaged herself in the sake of the rose window. She meant there would be great sorrow if one could not bring the light in through the glorious rose created by architect Olaf Nordhagen (1883-1925). An idea was born one day when Marie walked past an exhibition of crafts in one of the city’s newspapers. The exhibition showed a commercial for a lottery for income to the Nidaros Cathedral interior project. She then thought that all norwegian women would do this if given the opportunity, give a handmade craft for the rose window. So the idea of a nationally giant lottery was born. In February 1926 a main committee was formed and they were granted a loan for the project’s operating costs. H.M. The queen (Maud 1869-1938) became the project’s protector. All bishops in Norway got a request for participation. By the end of May 1926 advertising about the project were printed in all norwegian newspapers. The rose window project achieved great publicity throughout the country. A total of 70 000 information brochures were sent and distributed. Information material was also sent abroad. As early as June 1926, the commitee received the first crafts. In total, the project received 1600 different handwork from all over the country. The goal was to collect 175 000 n.kroner and this goal was reached. Thanks to norwegian women, one was able to raise enough money to fulfill the rose window to the St. Olav’s anniversary in 1930. The rose window is a magnificent jewel on the west front of the Nidaros Cathedral, who from within, illuminates up the interior just like Marie Ihlen Gleditsch’s hope for this project was. 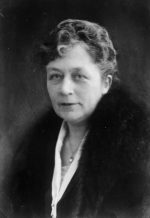 Marie Ihlen Gleditsch (1876-1965) was born in Kristiania, as daughter of a Supreme Court Attorney. In 1898 she married medical doctor Johan Arnt Hals Wetlesen, and she followed him when he got a position in Verdal that year. The tragedy hit the family hard when Johan Arnt died during a car accident with horse and carjol in 1903. In 1907 Marie was married with the priest Jens Gran Gleditsch. 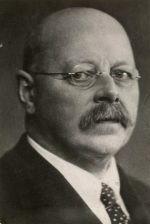 Jens was a liberal theologian and it sparked strong reactions when he was appointed bishop in Nidaros in 1923. Bishop Gleditsch got ill in 1927, and was from 1928 taken from his position as a bishop. Marie and Jens then moved to Bærum. The rose window shows “Dommedag”and is 12 meter high and 8 meter in diameter. The red field in the middle symbolizes Christ. From here there are yellow and red flames on blue bottom, and angels who sing and play. Among the angels are the four evangelists Matthew, John, Luke, and Markus. Below the rose there are 9 windows with Christ in the middle. The inscription at the bottom goes over all the windows: «Benedicti Venitr Poosidete Regnum. Discedite maledicti in ignem eternum. “(Come blessed, inherit the kingdom, go away, you cursed, in eternal fire)”. Portrait of Gabriel Kielland, ca. 1930–35. From Byhistorisk samling by Oslo Museum. Gabriel Kielland’s great work is the glass paintings in the Nidaros Cathedral and his main work is the rose window who was completed for the St. Olav’s anniversary in 1930. The glass paintings was performed in the period 1913-1934 after winning a competition in 1908 about glass paintings for the reconstruction of Nidaros Cathedral. Gabriel Kielland used antique glass from Britain, France and Germany. Faces and details was drawn directly on the glass. For his work, Kielland was appointed a knight of 1st grade of St. Olav’s order in 1934. Gabriel Kielland’s private archive is at NTNU University Library/Dora library. The archive consists of a rather random collection of photographs and newspaper clips relating to his exhibitions and personal anniversaries. Kielland’s drawings and sketchbooks are kept by Trondhjems Kunstforening, apart from the drawings of glass paintings from Vaksdal and Ullern church who are filed at the Riksantikvaren in Oslo. Gleditsch, Marie, Rosevinduet i Trondhjems domkirke og kvindernes indsamling til det. [u.å]. s. 9-12: Ill. I: Gammelt og nytt fra Trøndelagen, Møre og Namdalen. – Oslo: Oppl. 1925-1927. Slapgaard, Bjarne, Under rose med rubin, Roman, Det Norske Samlaget 1985. Suul, Torgeir Flekk, Nidarosdomen glassmaleriene, Nidaros Domkirkes Restaureringsarbeider 1983.